Postcard from Qasid Arabic Institute! 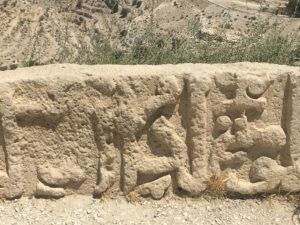 Amanda Racine, a PhD student in Medieval History, sent this postcard about her experience this past summer in Jordan studying Classical Arabic. 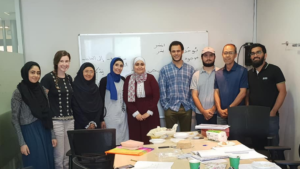 With the support of the GSAS Student Support Grant and the Joseph R. Leahey Fellowship both from Fordham, I traveled to Amman, Jordan this summer to study Classical Arabic at Qasid Arabic Institute. In addition to the grants from Fordham, I received a CARA Summer Tuition Grant from the Medieval Academy of America. Amman is an amazing city and Jordanians are extremely friendly and welcoming. Exploring Amman was really enjoyable (especially after learning how to navigate the taxi system.) My lessons at Qasid consisted of four hours of grammar lessons a day (Sunday-Thursday) and additional lessons focused on pronunciation. It was a really intensive course but my classmates and teachers made it a joy to attend. My teachers had lived in Jordan their whole lives and were wonderful resources not only for Arabic, but also for where to find the best food in Amman! When I was not in class, I was able to spend some time traveling around Jordan. 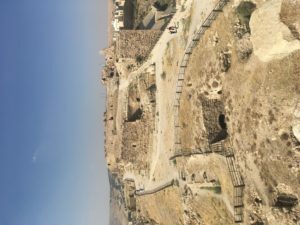 Although not a major hub of crusader settlements in the twelfth and thirteenth century, there are a number of castles built during the crusades that now lie within Jordan’s borders. 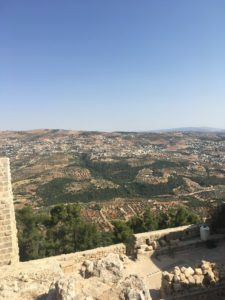 I visited Ajloun (one of the few Muslim fortresses), Shoubak, and Kerak. There were a number of Roman ruins located in right in the heart of Amman as well. I also visited one of Jordan’s most famous sites, Petra. 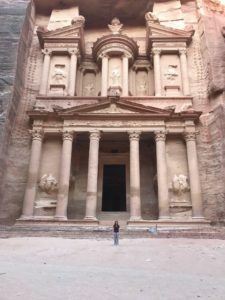 The most famous part of Petra, the Treasury, was certainly awesome, but I most enjoyed exploring the narrow passageways and the views from the high cliffs. 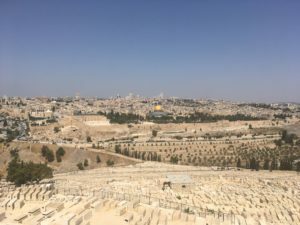 I was also able to make one short trip to Jerusalem. In Jerusalem I met with some crusade scholars who live in the region and walked around the Old City. It was an exciting combination of being able to hear about some of the research being done in the area and then actually be able to visit the places that we discussed. 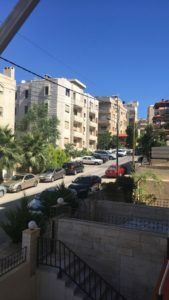 Overall, my summer in Amman was a valuable experience. This was my first time in the Middle East and as someone who studies the Latin East in the twelfth and thirteenth centuries it was amazing to get a better sense of the landscape (soo many hills!) and culture of the region. I was able to not only build a solid foundation in Arabic but also meet some really wonderful people. I look forward to continuing my studies in Arabic and hope to return to to Jordan again soon. إن شاء الله. Comments Off on Postcard from Qasid Arabic Institute! Odetta Felious Gordon Holmes – commonly known by her stage name, “Odetta” – played an instrumental role in the rise of American folk music as a mouthpiece for dissent during the social movements of the post-war era. She abandoned a life she planned in opera and oratorio for a career as an interpreter of African American slave songs and spirituals, material originally recorded by song collectors John and Alan Lomax in travels through the Mississippi Delta region. Odetta has claimed that while a life in oratorio would have enriched her vocally, its musical lineage had “nothing to do” with her experience. In contrast, a new repertoire of songs she gathered – songs derived from slave laborers, prison chain gangs, longshoremen, and church congregations – allowed her to shape her identity as a performing artist in crucial ways throughout her fifty year career. As a folk singer, Odetta co-constructed a cultural movement which drew inspiration from song writers of the past – composers of “freedom hymns” – to seek liberation in the present. For Odetta, such liberation was, at first, primarily for herself. As an African American woman who suffered the indignities of segregation, she felt she carried a “dragon” inside, one that hated herself and others. With a broad, black body of which she was ashamed, on stage Odetta tried to conceal and neutralize herself as a racial and gendered subject as she donned long, dark clothing, and threw herself fully into the material she performed. Through an act of self-abnegation, she performed the music, often of black men, who insisted on affirming their existence, the validity of their subjectivity, despite the oppressions that came with circumstances they faced involving humiliation and forced confinement. As an arbiter of the folk tradition, Odetta offered her body as bridge to connect a new generation of listeners with marginalized experiences of the past. As such, Odetta became a cultural broker of a folk tradition of dissent. She relied on a common method among performing artists – benefit concerts – to raise substantial funds for civil rights causes. Odetta’s life in music became a site of self-emancipation as she transformed from a suffering artist who often behaved subserviently to one who invented an identity which insisted on her own personal dignity. Furthermore, the exposure she gave her listeners to a nearly forgotten black cultural heritage enabled them to empathize with the experience of past singer-songwriters, seeing injustice in the present as more pressing than before. Odetta’s appeal to the idiom of folk and the benefit concerts she held directly supported the civil rights movement and related social mobilizations through the 1960s and 1970s as she helped to inspire not only political and legal change, but freedom in the arena of culture and emotion. 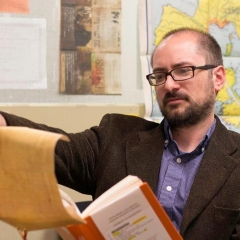 Dr. Noël Wolfe (PhD, Fordham, 2015) recently accepted a tenure-track position at Nazareth College in Rochester, New York as an Assistant Professor of History and the Program Director for the Legal Studies Program. Dr. Wolfe completed her dissertation, “A Community at War: the Bronx and Crack Cocaine” in 2015. 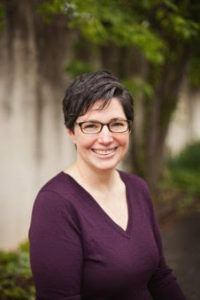 For the past two years, Dr. Wolfe has been the Helen and Agnes Ainsworth Visiting Assistant Professor of American Culture at Randolph College. In this position, she designed a 12-credit semester-long experiential program that examines the intersections of race, gender, sexuality, class and law through the lens of drug cultures in America. Through course work, discussion, travel and guest lectures, students explored the racialization and ethnicization of narcotics in the U.S. and investigated how racial and ethnic bias influenced popular opinion and drug-related public policy and law. You can find more information about Dr. Wolfe’s program at https://rcamericancultureprogram.wordpress.com. Dr. Wolfe also taught courses on incarceration, African-American history, and law while at Randolph. Dr. Wolfe is very excited to begin her new position at Nazareth College, which will allow her to explore her research and teaching interests in history and law, as well as put to use her practical experience as a trial attorney. At Nazareth, Dr. Wolfe will teach courses in U.S. and African-American history, as well as courses on law, drugs, and incarceration.